“kar.ge ქართული ქარვასლა” წარმატებით ჩატარდა! არადა 2015 წლის აპრილის დასაწყისში ვინმეს რომ ეთქვა, რომ სექტემბერში ასეთი თემას შევეჭიდებოდით, ალბათ არც კი მოვუსმენდი …. 2015 წლის 26-27 სექტემბერს მოძრაობა kar.ge და სავაჭრო & ბიზნეს ცენტრი ქარვასლას თაოსნობით ჩატარდა საქართველოში წარმოებული ხარისხიანი პროდუქტების გამოფენა-გაყიდვა – “kar.ge ქართული ქარვასლა”, რომელშიც 22 ქართული კომპანია ასობით პროდუქტით ჩაერთო და 2000-ზე მეტ სტუმარს ქართული პროდუქცია დაახვედრა. მიზანი რა თქმა უნდა იყო ხარისხიანი ქართული წარმოების პროდუქტების წარმოჩენა და პოპულარიზება. გამოფენა-გაყიდვა სავაჭრო & ბიზნეს ცენტრ ქარვასლაში [ც.დადიანის 7] ჩატარდა და დატვირთული იყო თემატური სადღესასწაულო აქტივობებითაც. ჩვენ ერთად შევქმენით ღირებული მოვლენა, თუმცა ამას ყველას მხრიდან დიდი ენერგიის ჩადება და რაც მთავარია კარგი საქმის კეთების დიდი სურვილი დასჭირდა. 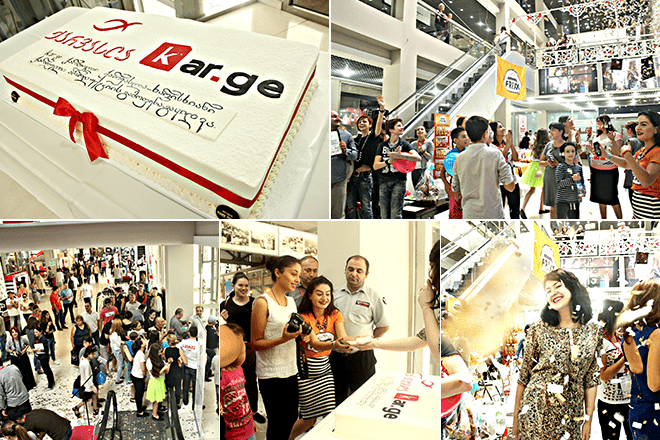 The first “Kar.ge Kartuli Karvasla” was successfully arranged! 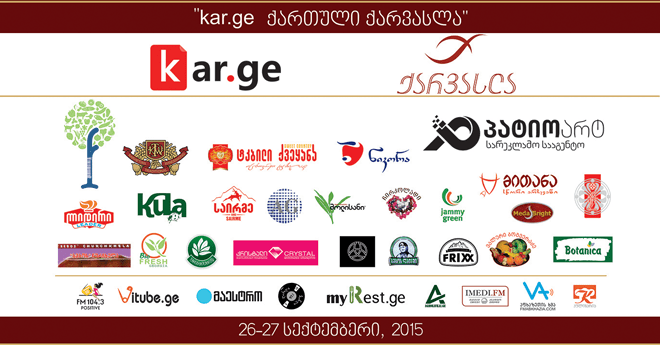 The kar.ge movement and the Karvasla Shopping & and Business Center hosted the exhibition and sales of the quality Georgian products – “Kar.ge Kartuli Karvasla” on 26-27 September, 2015. 22 business companies with hundreds of their products actually hosted more than 1,000 visitors. The goal was to promote the products that are produced in Georgia. The event that took place on Ts. Dadiani St. #7 was also loaded with thematic activities. Together we created a valuable event, but it required lots of energy twinned with the great motivation to do something good. როგორ დავიწყეთ? / How did we start? ქარვასლას მარკეტინგის მენეჯერმა – ნატალია საგინაშვილმა გამოფენა-გაყიდვის გაკეთების იდეა პირველად აპრილის ბოლოს გამიზიარა. აქამდე მსგავსი, ანუ ქართულ თემაზე ორიენტირებული გამოფენა-გაყიდვა არაერთხელ ჩატარებულა და ალბათ კიდევ ბევრჯერ ჩატარდება სხვადასხვა ორგანიზაციების მიერ [სახელმწიფო, კერძო] სხვადასხვა თემაზე [ღვინო, ყველი, საკვები თუ სხვა სახის პროდუქტები], სხვადასხვა მასშტაბით [საგამოფენოდ დადგმული 2 მაგიდაც მახსოვს და “გაშლილი” რუსთაველის გამზირიც] და სხვადასხვა ქვეყანაში, ამიტომაც დიდი პასუხისმგებლობა იყო ამ თემასთან ჭიდაობა. დაგროვილი გამოცდილების გააზრების შემდეგ ორგანიზატორები მივედით ოპტიმალურ მოდელამდე. პოტენციურ მონაწილეებთან და მხარდამჭერებთან ინტენსიური კონსულტაციების შემდეგ 4 აგვისტოს ოფიციალურად გავაფორმეთ მემორანდუმი, რომელსაც ხელი მოვაწერეთ სავაჭრო & ბიზნეს ცენტრის დირექტორმა – ბნ. ზურაბ შავლაყაძემ და მე, რითაც ღიად დავაანონსეთ ღონისძიება. იმ მომენტიდან დაიწყო ინტენსიური მუშაობა მხარდამჭერებთან, მედიასთან, კომპანიებთან და ყველა დაინტერესებულ მხარესთან. Natalie Saginashvili – Karvasla Marketing Manager shared the idea of an event with me in late April. The events like this, that is the thematic exhibition & sales of the Georgian products, were many times arranged in Georgia before. They were done different organizations [state, private] on different topics [wine, cheese, food or other products] in different scales [I remember 2 exhibition tables as well as “loaded” Rustaveli Ave.] and in many countries, therefore it was an utmost responsibility to tackle this topic. Based on the accumulated experience we found out the ideal model. After thorough consultations with the potential participants and the supporters we – the director of Karvasla Mr. Zurab Shavlakadze and me, signed the memorandum of cooperation on the 4-th of August and thus announced the event. The intensive work with the companies and supporters started up since that moment. განსაკუთრებული მადლობა მინდა ვუთხრა მხარდამჭერ ორგანიზაციებს – საქართველოს ფერმერთა ასოციაციას და სარეკლამო კომპანია პატიოარტს გაწეული მხარდაჭერისათვის. პირველმა თავისი რესურსის ჩართულობით ჩვენს მიმართ ინტერესი საჭირო საზოგადოებაში გააღვივა, მეორემ კი გამოფენა-გაყიდვისთვის საჭირო პრეს ბანერი, ბეიჯები, სერტიფიკატები, სტიკერები, სავიზიტო ბარათები და გათამაშების ყუთი დაგვიმზადა. I would like to especially thank the supporter organizations – The Georgian Farmer Association and the Advertising company PATIOART. The first one helped us to attract the needed attention, the second helped to prepare all the promo materials for the event – press banner, badges, certificates, stickers, visit cards and the special box for the cheques. დიდი მადლობა მინდა ვუთხრა მონაწილე ქართულ კომპანიებს. 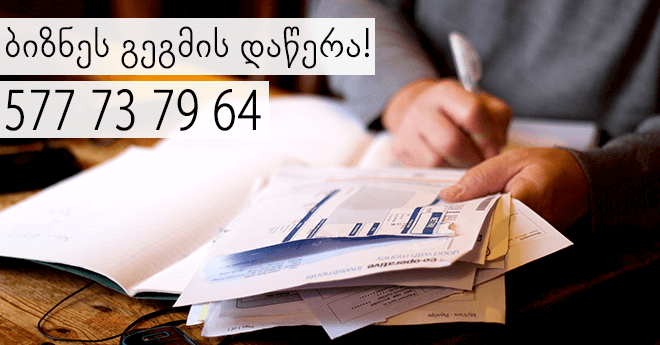 ვაღიარებ, რომ კომპანიებთან მუშაობა ურთულესი პროცესი იყო და ამას მე პირადად ვუძღვებოდი. სირთულეზე სტატისტიკაც მეტყველებს: 10 კომპანიას ეხმიანები, 5 პასუხსაც არ გცემს, დარჩენილი ხუთიდან მაქსიმუმ 2 შეგხვდეს; ბოლოში კი 4 უარს გეუბნება და საბოლოო თანხმობას გაძლევს 1. ასე შევკრიბეთ 22 კომპანია. ამ პროცესში მე რეალურად დავინახე, თუ ვის აფიქრებს რეალურად ქართული საქმის კეთება და ვისთვის ღირს kar.ge ენერგიის დახარჯვა მომავალში. ჩემთვის უძვირფასესი გამოცდილება იყო ყველასთან ურთიერთობა. I would like to thank the participant Georgian companies. To confess, working with the companies was the hardest process I have ever experienced. I was leading the process myself and here is a bit of statistics here: If you contact 10 companies, 5 does not even respond; Out of the other half you will be lucky to meet 2, eventually 4 refuses, one agrees. This was the hard way to gather 22 participant companies, but a VERY valuable experience too as I clearly saw who really values Georgian cause and who it is worth to spend kar.ge energy in the future on. დიდი მადლობა მინდა ვუთხრა მედია მხარდამჭერებს, რომელთა გვერდში დგომამ საშუალება მოგვცა მეტ მომხმარებელთან მიგვეტანა სათქმელი. I would also like to thank the media supporters, that helped us to deliver our message to more consumers. სხვა რა ღონისძიებებით იყო დასამახსოვრებელი გამოფენა-გაყიდვის ორი დღე – 26-27 სექტემბერი? What other events did we have on 26-27 September? გასართობი ბავშვებისათვის ნამდვილად ზედგამოჭრილი აღმოჩნდა. 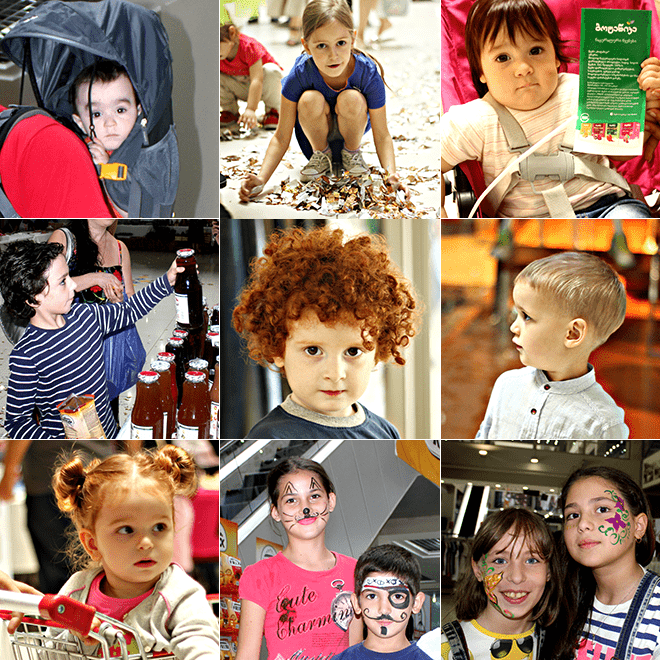 We made sure the children had fun in the exhibition hall. გამოფენა-გაყიდვამდე მიმდინარეობდა ბლოგერთა კონკურსი, რომლის 2 გამარჯვებული დაჯილდოვდა შაბათს, 26 სექტემბერს 17:00. We arranged the blogger competition and awarded two winners on Saturday, September 26.
გამორჩეული მყიდველები ქართული კალათით და სხვა ქართული პროდუქტებით დავაჯილდოვეთ. 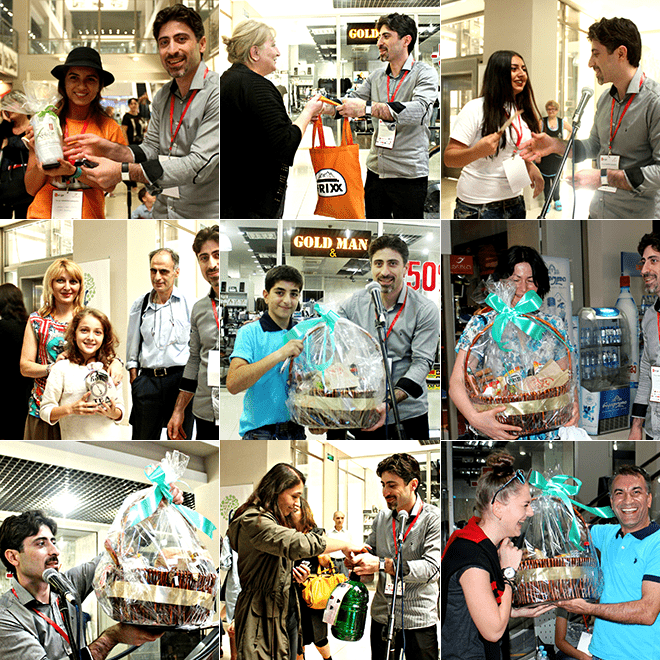 We awarded the distinguished consumers by the unique Georgian Baskets full of the exhibited Georgian products. უზარმაზარი უგემრიელესი ტორტი, რომელიც ტკბილმა ქვეყანამ დაგვიმზადა 400-მდე სტუმარმა მიირთვა. 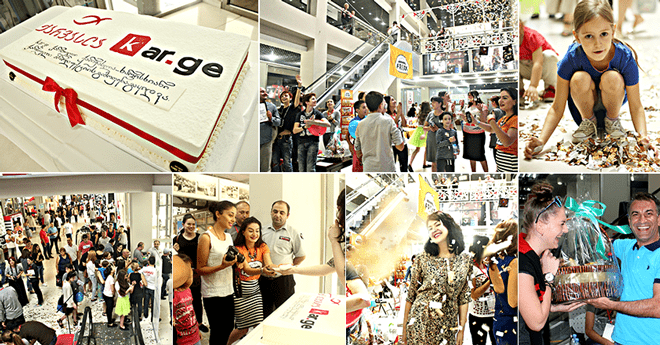 About 400 people enjoyed the enormous tasty cake that was made by the Sweet Country. როგორი იყო ღონისძიების მედია დაფარვა? / What was the media coverage of the event? “kar.ge ქართული ქარვასლა”-ს მხარდაჭერა სხვადასხვა ფორმით მრავალმა მედია ორგანიზაციამ გაუკეთა. დაიწერა სტატიები, გავიდა რეკლამები, გაკეთდა რეპორტაჟები, იყო პირდაპირი ჩართვები ტელევიზიებში. სადაც კი შესაძლებელი იყო მაქსიმალურად ვეცადეთ წარმოგვეჩინა ქართული ხარისხიანი პროდუქტები და თავად ღონისძიება. Many different media companies covered the “Kar.ge Kartuli Karvasla”. the Articles, ads, coverages, live coverages etc. We did our best to publicise the event and the products of the Georgian Companies whenever we had a chance. newsday.ge, agrokavkaz.ge , patioart.ge , ipress.ge , ipress.ge , ipress.ge , medianews.ge, ambebi.ge, cp.ge, eventsbook.ge, alva.ge, hapfind.com, roundtown.com, evensi.com, and.ge, patioart.ge , myrest.ge , kulinaria.ge , agrokavkaz.ge , ipress.ge , vitube.ge, marketer.ge, heyevent.com, ibusiness.ge. მოვიდა თუ არა სტუმარი/მყიდველი? / Did we have visitors/buyers? “ქარვასლაში ხალხი არ დადის” – ეს ფრაზა ძალიან ბევრჯერ უთქვამთ ჩემთვის კომპანიების წარმომადგენლებს მოლაპარაკებების ეტაპზე. ეხლა უკვე თამამად შემიძლია გიპასუხოთ: “ჩვენს გამოფენა-გაყიდვაზე 1000-ზე მეტი ადამიანი იყო, იმაზე მეტი ვიდრე მე პირადად ველოდი”. მიუხედავად იმისა, რომ “kar.ge ქართული ქარვასლა” პირველად ჩავატარეთ, მიუხედავად იმისა, რომ სექტემბერი ზოგადად არაა იდეალური ამ ტიპის ღონისძიებებისათვის, ფაქტია, რომ სტუმრიანობაც გვქონდა და გაყიდვებიც. “People do not visit Karvasla” – was the phraze that I often heard during the negotiation stage from the companies. “You are wrong! We had more than 1,000 visitors, far more than I expected and this is despite the fact the this was the first event of ours considering that late September was not the best time for such an event. The fact is that we had visitors as well as sales” – is my answer now. კიდევ ერთხელ დიდი მადლობა მათ, ვისთან ერთადაც გავაკეთეთ ჩვენი პირველი ღონისძიება. ეხლა მთავარია ამ წარმატების გამყარება და მასშტაბის გაზრდა. დიდი საქმეები გველოდება წინ. I would like to thank again those, with whom we made our first event. Now it is important to strengthen our success and scale it. We have a lot to do.